If the question you need answered does not appear here, feel free to contact our support team, either by phone, email, or our live support chat. What is Fergus Pay by Assembly Payments? Fergus Pay is a secure credit card payment portal that allows your customers to pay your invoices by credit card. It is provided by Assembly Payments. I don't have Fergus Pay activated, how can I turn it on? 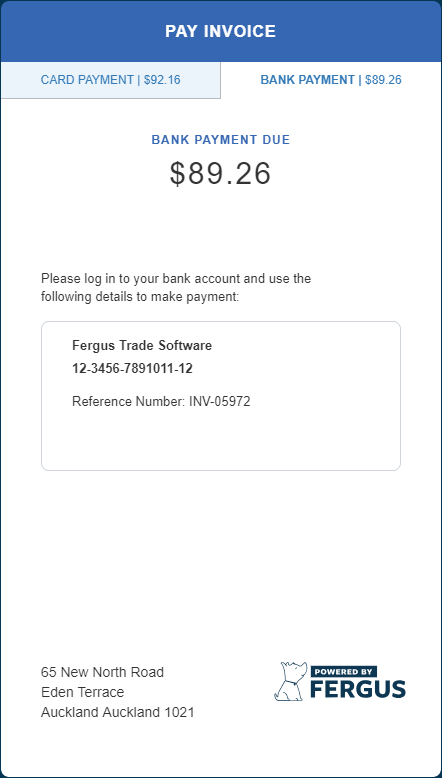 To activate Fergus Pay, hop over to ⚙ Settings > Fergus Pay and select Get Started. From there you can enter the details needed to get going. How do my customers view and pay their invoice? 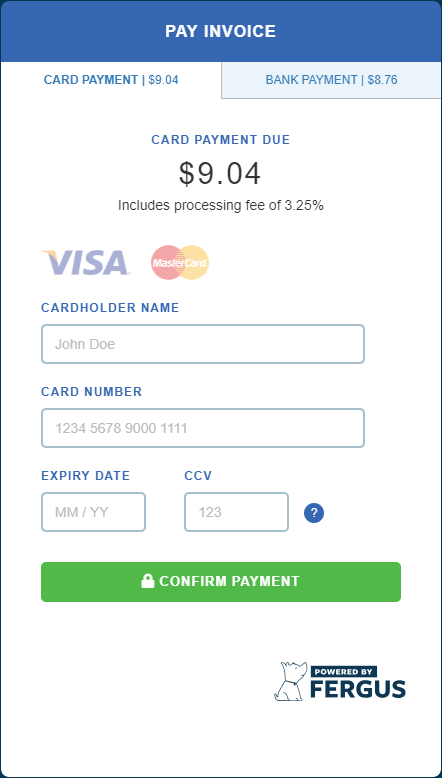 This button will take your customer to the payment portal where they can review their invoice and pay immediately by entering their credit card details. What does the payment screen look like to my client? The invoice sits on the left hand side of the screen and the payment area to the right. How do my customers download their invoice? Customers can choose to download the invoice from the payment portal, once they have clicked to view their invoice. Is there still a PDF attachment for Invoice emails? By default, if Fergus Pay has been activated then the invoice PDF will not be attached to the email as this has a few advantages. First, removing the PDF attachment and adding a button means we can track whether your customers have viewed the invoice or just opened the email. Second, by removing the PDF as an option we can direct your customers straight to the payment portal. It makes it easy for your customers to pay the moment they view the invoice and takes away some of the "barriers to entry". You are more likely to be paid on the day of invoicing with this method. Finally, this method is more secure. Invoices are much harder to alter when presented this way. However, if you do still need the PDF attachment to be present when billing your clients you can turn this back on in general from Settings > Invoicing, or you can attach it on a case by case basis when sending the email. Can my customer still pay by bank transaction? How long before I can expect to get paid? Payments will generally be available in your account within 3-4 business days. Larger payments may need to undergo fraud checks which can take a few business days. How does Fergus make sure transactions are not fraudulent? Fergus Pay is provided by a secure payment provider, Assembly Payments. Assembly Payments will perform Know-Your-Customer (KYC) checks on the cards used and the details provided to make sure that payments are legitimate. Your customer will be required to enter the necessary information when they make the payment. If you need to update your information, you can do so in ⚙ Settings > Fergus Pay. Once you have made the adjustments, make sure you hit the "Save Changes" button in the lower right to confirm. Does Fergus Pay add any extra cost to my Fergus plan? No, Fergus Pay does not add anything to the price of your usual Fergus plan, though transactions do incur a service fee. This service fee will be paid by your customers unless you choose to absorb the cost yourself. If you’d prefer to absorb the fee, please make this change in your settings. I am based in New Zealand, how much is my service fee? For New Zealand businesses, the service fee is 3.25% of the invoiced total. I am based in Australia, how much is my service fee? For Australian businesses, the service fee is 2.3% of the invoiced total. How do the payments sync across to my accounting package? Payments will be handled the same way as before - they will sync across as a transaction that you will need to reconcile against the correct invoice. You will be able to see a list of Payments in the Fergus Pay Report, and you can also click the Xero or MYOB logo beside a synced payment to be taken to it in your accounting package (just like a synced invoice). How do I process the payments in my accounting package if I have absorbed the service fee? Since the payment will be less the service fee, you will need to assign the payment to the invoice and then assign the outstanding remainder on the invoice to an account code for transaction fees. If you go to the invoice in the job and view the payments area for it, you can click on the arrow icon next to the credit card payment. From there, a window will pop up asking for a reason and confirmation.